It's been a while since I last published. I've had my plate full with classes, the shop and then the Influenza! I've had for a few weeks now, this entry about one of my favorite clothing brands. And yes... it had to be scandinavian. 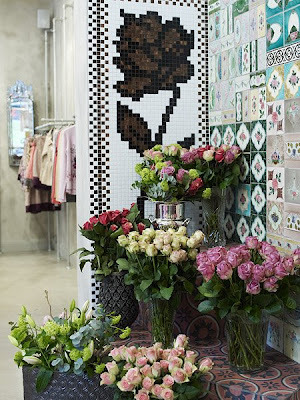 Swedish brand Odd Molly opened its first concept store last february, in Stockholm, Sweden. Unfortunately, their clothes are very hard to find in the US and inexistent yet in Mexico. The new colorful shop looks great from the pictures and it provides the label with a way to demonstrate what the brand is all about: Feminine bold, ethno and boho-inspired patterns and prints that are mostly all hand made. Their creative director Per Holknekt says they like it this way because handmade is imperfect and adds lots of character, many of their designs cannot even be done by machine. He also admits Odd Molly is slightly allergic to black, their collections are all about color and texture although they do have some "almost black" pieces. I wish they open a store in the US soon! You can visit www.oddmolly.com to get a grasp on what the craze in Europe is all about.